AWARE wants to help you get your dogs spayed and neutered! “$75 PupSNIP”: Upon receipt of your application and proof of residency, a “$75 PupSNIP” discount voucher to apply toward the cost of a spay or neuter surgery and a list of participating veterinarians will be sent to you. Click here to download application form or call toll free 1-866-315-6032 and an application will be mailed to you. 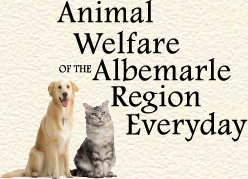 Applications may be also picked up at Tri-County Animal Shelter /Adoption Center, 138 Icaria Road, Tyner, NC. Limit 2 vouchers per household per month. Voucher expires 90 days from date of issue.